How old does my child need to be to take guitar lessons? A child needs to be 8-9 years old to begin guitar lesson. 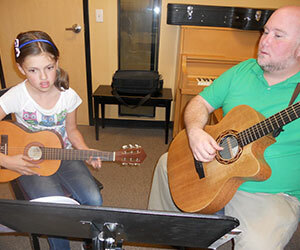 For younger children who are interested in lessons, the guitar teacher will do a simple motor skills test. What kind of guitar should I purchase? We recommend a nylon string classical guitar, full size for larger children and adults; ¾ size for smaller students. The teacher can advise you if you aren’t sure what size to purchase. Where can I buy sheet music for the guitar?